NEW: Twitter user: "in bed trying to sleep... just heard another blast!" Dubai-based man said shooting, grenades like "in video games"
(CNN) -- Gunmen targeted several areas in the Indian city of Mumbai on Wednesday, taking scores of hostages, killing dozens and taking over the Taj Mahal Hotel and Hotel Oberoi. A fire burns through the dome of the Taj hotel in Mumbai Wednesday. Below is a list of eyewitness accounts from news agencies in the area as well as blogs and Twitter postings. "Me and my friend escaped down the fire exit, but I think they took more people upstairs. They tried to get to the roof ... [with] about 15 people, i think about half were foreigners. There were two gunmen, young boys, maybe 20 years old ... 25. There was a lot of smoke, but they had two guns. They came from the restaurant and took us up the stairs. They had bombs. There was something, because there was a lot of smoke. They wanted anyone with British or American passport ... so I guess they were after foreigners." "I was just sitting and reading the paper. ... I started seeing the sound was increasing and bodies started falling and all of the bloodshed. ... People were crying; people were limping. We were frightened; we started to run. I was trying to see if I could see anyone carrying a gun or anything, but I couldn't." "I was fortunate to have managed to escape the hostage situation at the Taj hotel located near the Gateway of India. ... I heard a loud explosion and the firing, and all those present at the hotel lobby were bundled into the hotel basement by the hotel staff. I had come down to Mumbai to meet a business client at the Taj hotel. There were people running everywhere. It was a panic situation. ... It went on for 15 to 20 minutes. After they caused an impact, the gunmen moved away, and that is when managed to escape with some others." -- Jacob Joseph Thuthanparambil, a Dubai- based Indian who was in Mumbai for a meeting, described the shooting and grenade-throwing as what "you see in video games." "At around 9 p.m., all of us came to the ground floor to have dinner. When we were eating, we heard heavy firing. It was so rapid that I thought someone was celebrating with crackers. Then we heard huge blasts. The waiters told us that it seemed to be a terrorist attack. The senior staff then took all of us to the back of the hotel. We were in the swimming pool area and asked to lie on the ground. All the MPs and parliamentary officers were holed up there on the floor for some 60 to 80 minutes. We heard the sounds of firing without uttering a word. One injured foreigner was also with us. We were some 50, 60 people, waiting to escape. We didn't know what was going to happen next." "The taxi was shattered to pieces. Only the [tires] and the chassis were left. Three people died in the taxi. One victim's head flew 10 feet onto the divider. You cannot tell who the victims were or their age; they were injured so badly. Flesh was all around." The State Department has established a Consular Call Center for Americans concerned about family or friends visiting or living in Mumbai, India. The number is 888-407-4747. Chamberlain and another man sneaked out a fire exit. "I phoned my girlfriend and told her I loved her and thought it would be the last time I would talk to anyone," he said. Chamberlain walked downstairs and smashed a window. "The smoke was so thick, I thought we were going to suffocate," he told SkyNews.com. A Mumbai-based photographer known as Vinu has uploaded dozens of photos of the attack to his Flickr account, showing chaos and destruction throughout the city. 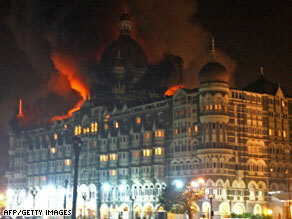 "Emergency" can some one check if there bomb blast of some shootout in oberoi hotel of anywhere in Mumbai ? I am at inox inside"
"I could hear noises outside hard to make out if it gun shootout." "when I heard noise outside you could see people scared crying"
"I just heard a blast - confirmed mid-sentence by the reporter live on TV. grim situation." "@#$%&* in bed trying to sleep... just heard another blast! 5:53am"